Commonly referred to as laminate, melamine doors are manufactured from a pre finished particle or MDF board with a decorative melamine coating on both sides, typically available in a 16mm thickness, or 18mm in selected colours and brands. 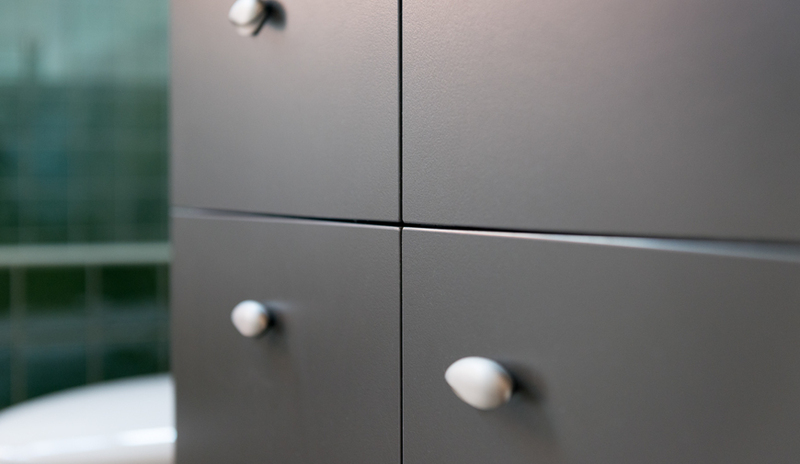 At Contour Cabinets we only use board that is MR or HMR (high moisture resistant) and then this is edged with a durable ABS edge in 1mm or 2mm depending on availability and preference. There are 100’s of decors to choose from, including solid colours, patterns and woodgrains. Finishes available are: matt, satin, texture, sheen, finegrain, nuance, ashgrain, crystal gloss, Createc full gloss. Cost effective, durable, scratch resistant, low maintenance, easy to clean, vast selection of colours and finishes. The most cost effective door choice.